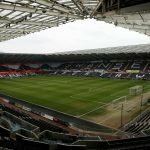 Swansea City produced their best 45 minutes of football in the first half of Tuesday’s 3-1 home win against Stoke City, according to manager Graham Potter, and it’s hard to argue after a superb performance that saw an attacking quartet cause all sorts of problems for a Stoke City side who had kept 6 consecutive clean sheets. That first half saw us dominate with 71% possession, 16 shots, 5 on target, 2 goals and 90% passing accuracy with 330 of 365 passes successful. The pass maps we feature in this article aim to show the average passing positions of the starting eleven up until the first substitute (68 minutes). They also provide the team shape in terms of passing, where passes were played, the number of passes attempted and the pass accuracy per player. Not only that but they are also split between the overall average, the low or defensive phase and the attacking phase. This can demonstrate how each players’ passing activity changed in a deep, defensive position compared to their more advanced, attacking position. So for example, did our full backs push forward? 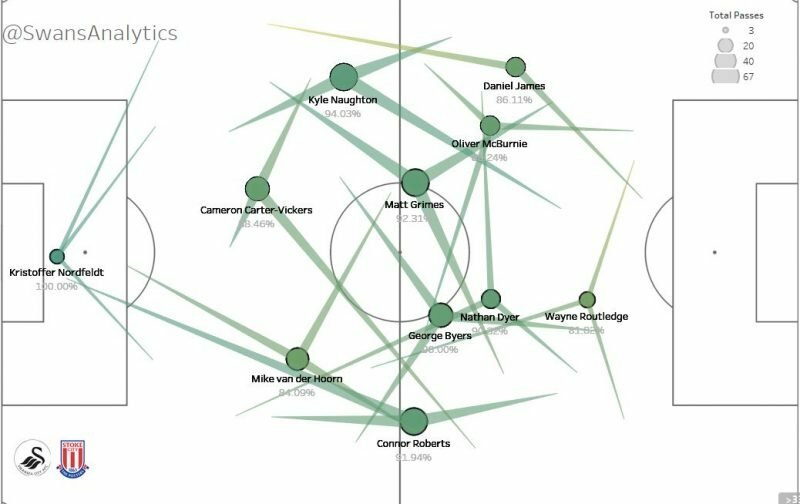 Where did Wayne Routledge make most of his passes as a false nine and where did Oli McBurnie play? The average pass map is shown below. The dot size represents attempted passes, the position is their average position from where they played a pass from (calculated via k-means clustering) and the three arrows from each player shows their most common area of pass. Firstly, goalkeeper Kristoffer Nordfeldt had 100% pass accuracy and every pass he made was within his own half, the majority of which played short and barely moving outside of his penalty area. Oli McBurnie came in to replace the injured Bersant Celina and rather than taking a place up front as you might have expected, he simply played in Celina’s left sided role, looking to play passes for Dan James to chase down the left flank. 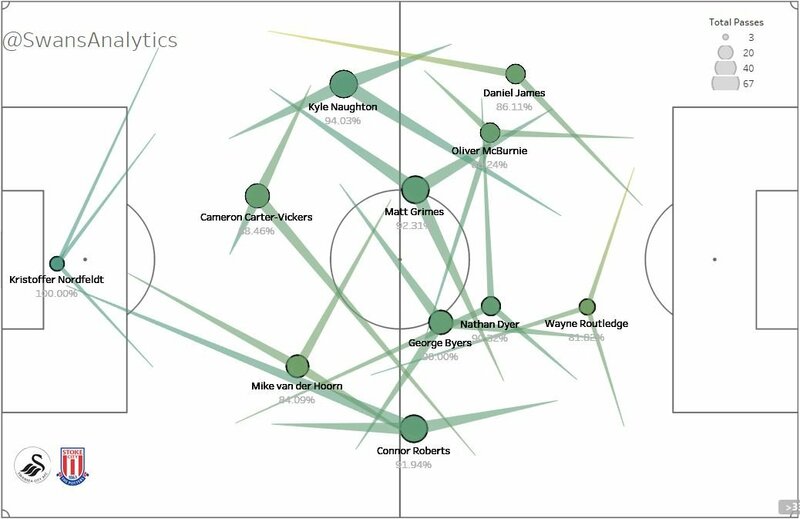 The width of the passes for each player also shows the total number of passes for each direction so for example, Grimes and Naughton made a high number of forward passes. Click the next button below to view the low / defensive pass map.